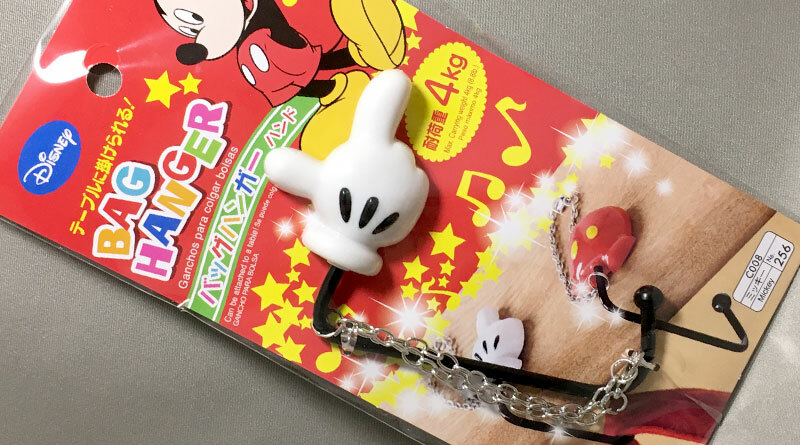 The pad part that rests on the tabletop is shaped into Mickey Mouse’s white glove, and with one finger pointing out. 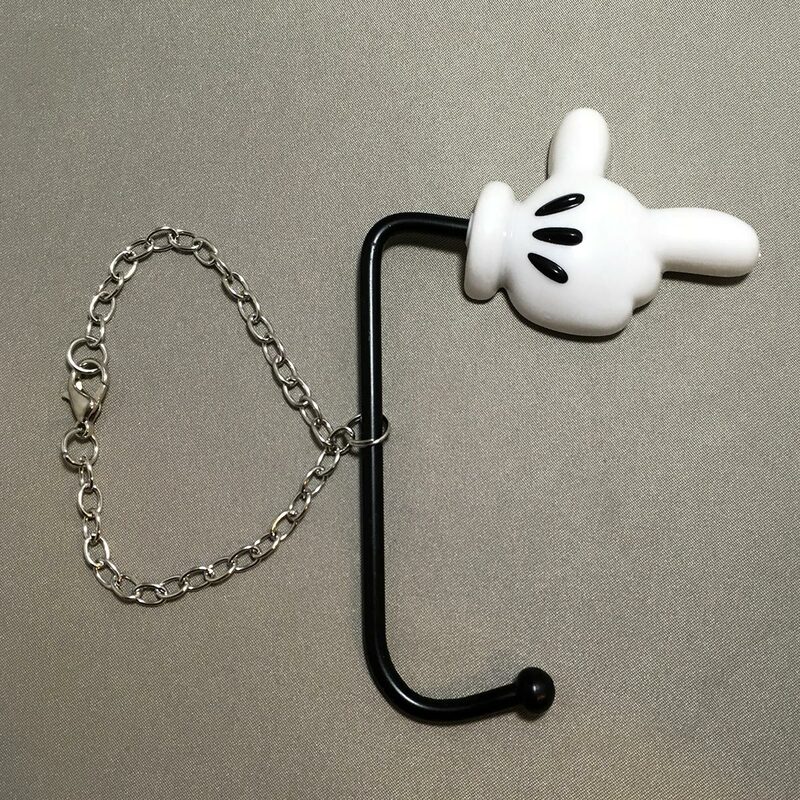 Mickey’s glove can swivel and rotate for storage. 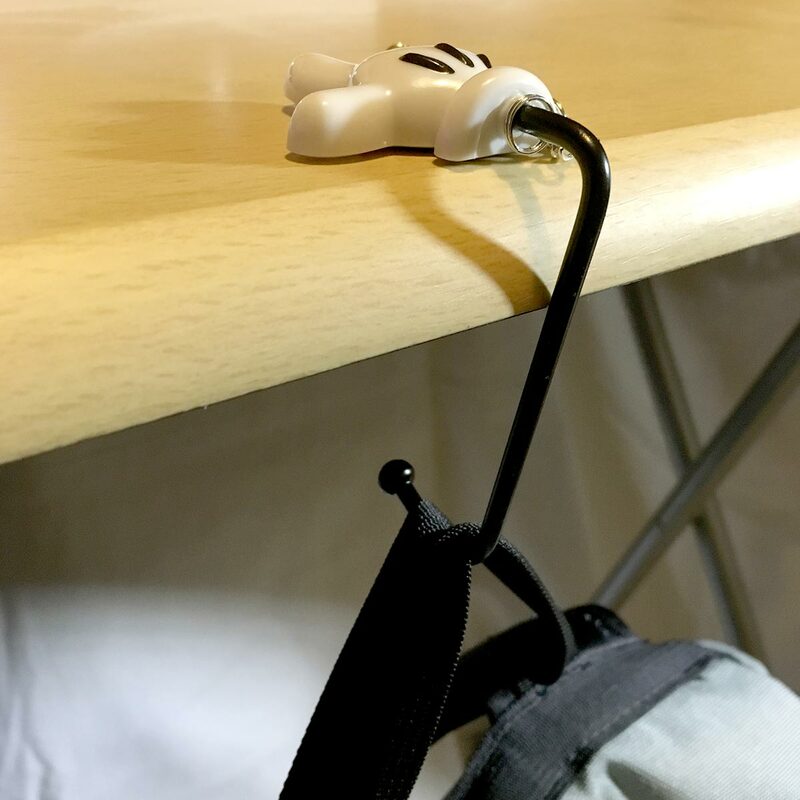 A non-slip cushion on back keeps the Mickey bag hanger firmly on the tabletop, while protecting the surface from scratches. 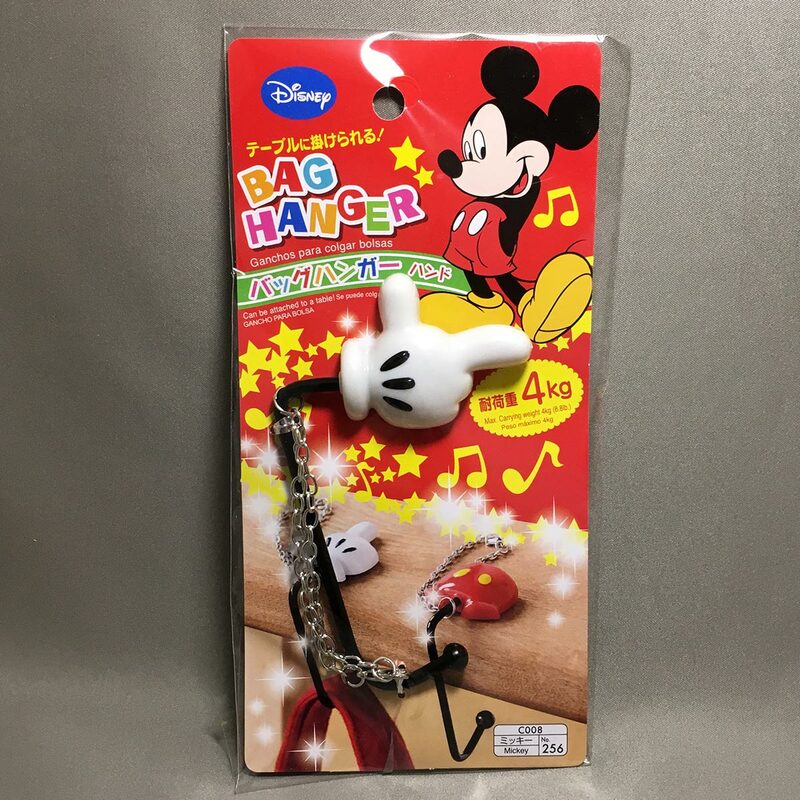 Attached to the Mickey bag hanger is a chain, which can be used to chain the bag hanger to the bag when it is not being used. 1. Rotate Mickey’s glove until it rests horizontally on the table top. 2. Hang bag on the suspended hook. – The bag hanger contains small parts. To avoid danger of suffocation, keep the bag hanger away from children. – Do not wrap chain around fingers. – Do not apply force or swing the bag hanger around as it may damage the bag hanger. – Depending on the shape of the table, the bag hanger may not rest securely to the table top. – Do not hang bags or items that exceed the maximum carry load as it may cause the bag to fall off the bag hanger, and may cause damage to the bag hanger. Check also that the bag hanger is secured to the table top. – Take care not to scratch the table top when removing the bag hanger. 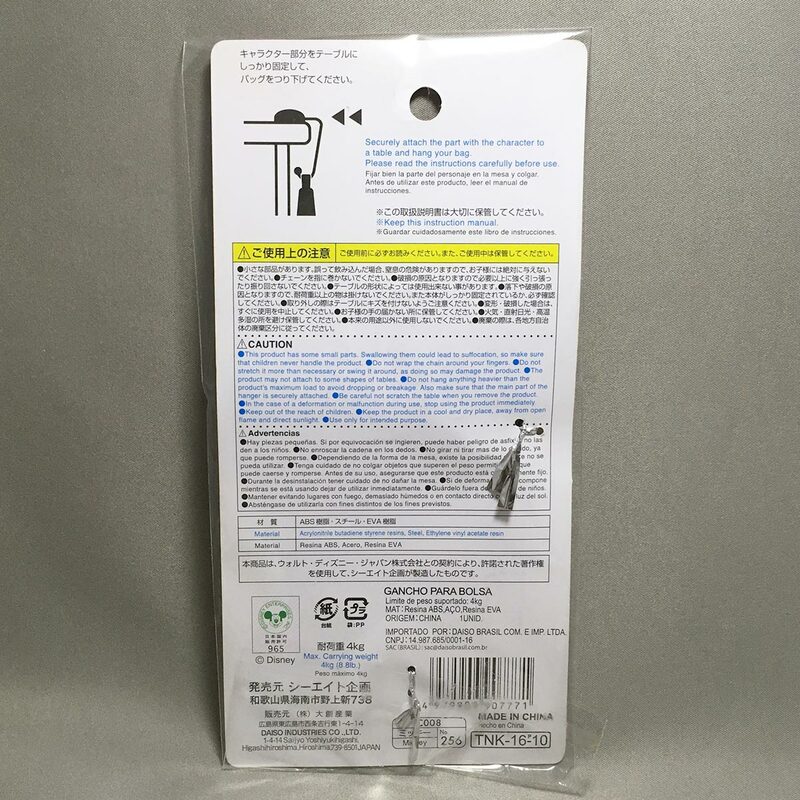 – Do not use if there are any damage or deformation to the bag hanger. – Keep away from fire, direct sunlight, moisture or other heat sources. I found this in a large Daiso store and thought it would make a great souvenir or gift. It’s very simple to use, and the glove gives is a novelty feel. 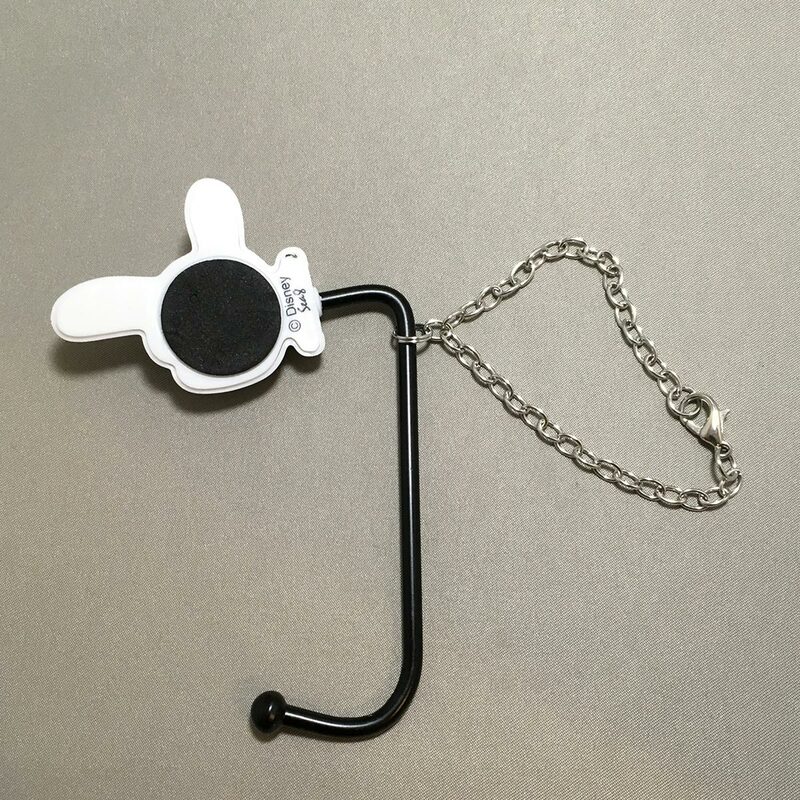 Unlike the bag hangers with the foldable hook, this bag hanger isn’t very compact to store. It manages to hang my bag on the table edge, and it has Mickey’s white gloves on the table top, what else can you ask for?